In spring, when new queen bees are hatching – and especially if the bees have been well fed over winter – new swarms may form and leave the parent hive. Swarming bees are not usually dangerous, and, as with most bees, will not sting unless threatened. They look for a home in a tree or branch, then search for nectar to support the new colony. 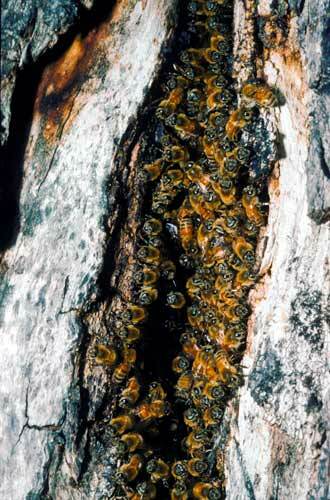 This swarm has relocated to a hollow tree.